Very rarely in life does one encounter a book with the magnitude of Viktoras Kulvinskas' Survival into the 21st Century. Within it's pages, Love consciousness springs forth from a master of body ecology. Viktoras' pioneering work has touched so many people, it is considered by many as a "new age bible" in the holistic and health field. Few can resist the wisdom and experience this buried treasure shares and although Survival was written 27 years ago, one would be amazed at how time stands still within it's pages. Learn how to heal yourself from the whole spectrum of illness and degenerative disease - from cancer and arthritis to heart disease and the common cold - by the use of living foods. Find out how to experience the esoteric realities and bliss of the universe, the energy of divine love,as proclaimed by the ancient masters. Various forms of yoga and meditation are thoroughly covered to attain vibrant health and perpetual youth. The phrase, "you are what you eat" cannot be more evident as Kulvinskas expertly breaks down what we eat, how we eat it and the effects of those foods have on our human temple. Food combining, vitamin and mineral content, calories, enzymes, water, wheatgrass and sprouting are all defined in very simple terms and in fact, easy enough for a child to understand the common sense of it all. Cooked food vs. raw foods, as well as various types of diet are discussed to achieve optimum nutrition. Sproutarian, fruitarian, vegetarian and macrobiotic are all choices that enlighten and inspire one to make positive change. Also covered are many methods of fasting, with advice on how to prepare and experience a glorious cleansing of the body. There truly is no territory that is not covered in Survival. The father, mother and child chapter touches on pregnancy, superior childbirth and how to raise the youth to achieve their fullest potential. A large amount of alternative therapies are included. Physiognomy, iridology, zone and color therapy, massage, acupressure and healing herbs are all supported by amazing testimonials. What was once the rebirth of the of the living food movement is now an even more relevant and precious gift. This book should be standard reading for anyone interested in the health and healing world. The range of topics are vast and have clearly been supported by science over the recent years. From students to teachers...Survival is the ultimate reference guide to a very unique and special lifestyle. 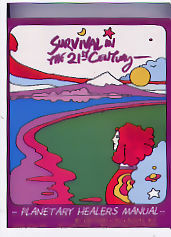 ORDER / PURCHASE "SURVIVAL IN THE 21ST CENTURY"